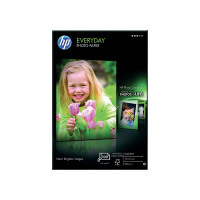 Designed for economical usage, HP White Everyday Glossy Photo Paper is great for quick and easy printing of photos. You don't need to worry about wasting expensive photo paper - just print out home photos whenever you want. Designed to allow ink to dry instantly, this paper is smudge and water resistant for quality that lasts straight from the printer.